Old and tarnished, small pieces of metal were how Yaudheya coins were found for the first time by some canal digger way back in early 1800’s in Saharanpur (Uttar Pradesh). After which numerous hoards of tribal coins were found from Western U.P. Rajasthan and all over India and also present day Pakistan. 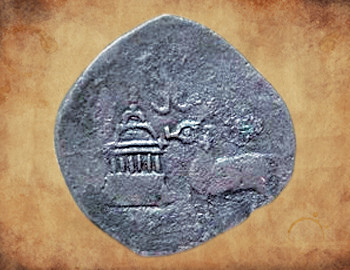 Yaudheya coins caught the attention of great numismatist James Prinsep; but as there was no information available at that time he wrongly assigned these coins to Indo-Greek kings. Later after further research in Indian numismatics the coins were rightly assigned to ‘Yaudheya’ the warrior tribe. A new enchanting chapter of Tribal coins found its place in Ancient Indian History where there is depiction of temples on Yaudheya coins.